Blame it on Kathleen Skullney, B.A. ’91, J.D. ’93. She started the University of Baltimore ball rolling for two of her four children, and given the family’s positive reactions to their experiences here, there may very well be another generation enrolled as students in the not-too-distant future. Originally from Illinois, Skullney moved to Baltimore as a single mother primarily because of an extensive network of aunts, uncles, grandparents and other relatives in the area. After earning her undergraduate degree in jurisprudence in 1991 and her J.D. in 1993, both from UB, she spent a number of years working for nonprofit Maryland Legal Aid before retiring. Today, she is of counsel at Williams & Santoni in Towson, Md. Working with a UB admission counselor, Skullney was able to transfer credits she had received from Loyola University Chicago and from the Maryland Institute College of Art, and she began at UB as a junior. After completing her jurisprudence degree, she marched right on to the UB School of Law. 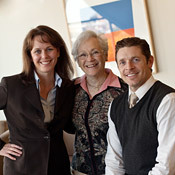 While Kathleen was in law school, her teenage son, Dan Nagle, B.A. ’11, now the University’s associate director of auxiliary enterprises, grabbed the bus from his high school to UB and waited for his mom to finish classes so they could carpool home to western Baltimore County. Alumnus Oleh Voloshyn, M.S. ’99, showed his UB pride when he traveled home to Lviv, Ukraine. Melvin Bandell, A.A. ’56, looks back on his time at the Baltimore College of Commerce, which merged with UB. The photo in our last issue sparked some fond memories of a criminal justice class at Fort Meade. Filmmaker Sylvia Allen, B.S. ʼ00, uses her award-winning short film to spur dialogue on domestic violence.